The successful Westport 112 model is 20 years old and, until the arrival of the second Lyons Pride, had remained largely unchanged since an update in 2002. All imagery courtesy of Maurizio Paridisi. The saloon’s taupe leather sofas are by Townsend and the armchairs are from NW Design Guild. The coral-patterned Kravet cushions reinforce the marine nature theme throughout. The dining area, with “Montreal” custom stainless steel ceiling light fixture from Wired Custom Lighting – the owners refer to it as the “sea urchin”. 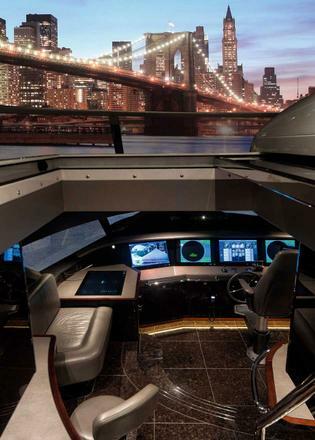 The owner liked the wheelhouse that Westport had designed for its new 125 yacht so much that he had it specially adapted for his latest 112. He likes to take the controls himself whenever he can. The owners of the newest Westport 112 picked meticulously through seashells to choose the ones that would be imprinted into the glass of their custom dining table. This attention to detail was just the shallow end of a deep involvement that ran all the way through the design and construction of their latest yacht. In fact, the scale of their goals and freshness of their ideas contributed to the launch of a brand new look for the successful series. The arrival of hull No 7758, the new Lyons Pride, coincides with the 20th anniversary of the Westport 112. The 34 metre raised pilothouse model has evolved since it first hit the waters of the Pacific in 1998, including a significant exterior update in 2002, but this is the most important styling change since. 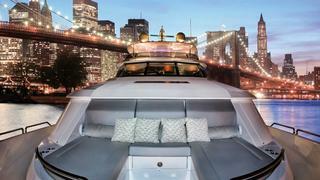 Slick and contemporary, the boat competed for attention with new offerings from European builders at February’s Miami Yacht Show, where it made its debut. It’s the second Westport 112 for experienced boaters, a husband and wife team: Michael (his middle name is Lyons) and Anne Marie Lord. Michael, an engineer by training, came to motor yachts via sailing – his earliest memory is of bobbing on a small boat off the coast of Baja California, Mexico, when he was 10. When he met Westport broker Andrew Miles back in 2012, he greeted him with detailed information on models from European, British and US builders he’d been considering for his next boat. He liked the engineering side of Westport, he told Miles, who had flown to the owners’ home to discuss the potential build, but the yachts’ appearance was not quite to his taste. He favoured a bit more pizzazz. As the discussion progressed, Miles marked up the drawings he’d brought with a red marker, denoting changes and additions that Lord wanted to make: skylights above the galley and VIP, a full-height wine cooler, moving bulkheads and increasing the size of the foyer. He wanted more modern joinery, and features on the overheads. It kicked the Westport 112 up a few notches and the builder went ahead, delivering in late 2013 hull No 7750, the Lords’ first Westport. They had the boat for two and a half years and enjoyed it until their broker presented them with an offer they could not refuse. 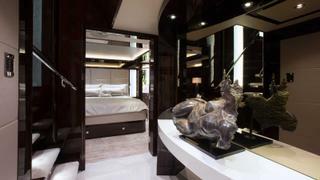 Miles had shown the yacht, as an example of Westport’s skill, to a younger client who wanted to buy it – Lyons Pride had not even been for sale. “That got Westport perked up a bit and they must have decided my ideas weren’t so bad,” Lord says. A few months after the sale of his first 112, the Westport team was again working with him on a new Lyons Pride. He intended to push them further. From his perspective, the first time around Westport had allowed him only “to tinker a bit with the design”. “We had quite a few meetings with that design team and started exploring what we could do to update the boat,” Lord says. Westport’s team was open-minded about it, even as it became clear the updates would require making a new mould for the popular model. “This is truly a collaborative effort,” Westport’s marketing director Ron Nugent says. “Michael knew of Westport’s capabilities and we liked his ideas, so we worked together.” The fact that the builder was moving in that direction for its newer models (the 125 now launched, and a 45 metre and flagship 65 metre currently in the works) was coincidental, he says, but the new Westport 112 dovetailed very nicely with the company’s overall strategy. Lord, who had looked at the new Westport 125, ruled it out in favour of another 112 – he wanted a boat of a size that he could operate himself – but from it he culled innovations that could be implemented on his second Lyons Pride. 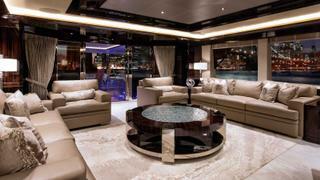 He talks about that process while seated in the sizeable galley on the main deck of his new yacht. It’s a great space, with a central island/bar and comfortable sofa wrapping around a table suitable for convivial meals under a large skylight. In the Miami sun, the inviting space is aglow with light. The builder’s way of working until now stems in part from its business model – keeping changes to a minimum allows it to keep a handle on production time and cost – and in part from its location on the Pacific coast. It is not unusual for boats to encounter five metre waves for hours while travelling up or down the coast. “We build these boats to be Pacific Northwest great sea boats and our naval architects did not want to compromise that. There had to be a lot of stiffening made,” Miles says. Other significant modifications, not obvious at first glance, included changing angles on the house structure, moving air intakes, redesigning the foredeck as a lounge, adding raised seating under the hardtop, squaring off the design’s exterior lines and extending the stern with a swim platform. The mast is that of the Westport 125. When they are on board, the Lords like to spend a lot of time in the galley and he is a licensed captain. “Owners of this [type of] boat tend to be more hands-on owners,” he says. 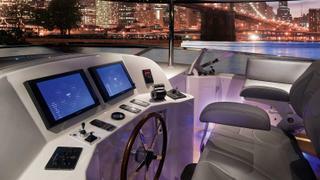 “The boat has to be user-friendly not only to the crew but also to the owners to operate the boat. 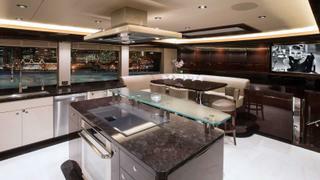 That is why this galley does not feel like a crew galley at all,” he says, casting a sweeping look around the space with its bar stools by Durante Furniture, with polished nickel and shagreen accents, stone worktops, a stain-resistant porcelain tile floor and full-size appliances. 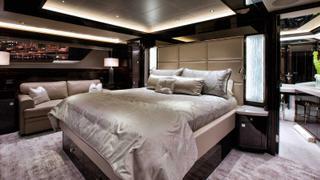 Another favourite spot for this owner is the pilothouse. Lord liked the glass bridge that Westport installed on the new 125 and worked with the yard’s engineering team to adapt it to the 112’s smaller dimensions. “We spent a lot of time redesigning all this,” he says. The captain’s lair on Lyons Pride is an eye-popper. A single Norsap helm seat faces the array of electronics and screens on the console. 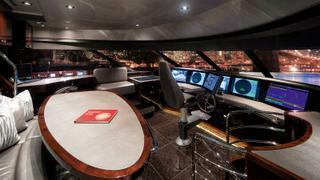 “The pilothouse is so much larger and more sophisticated than most boats of this size,” Lord observes. On occasion he likes to handle his own yacht. From the pilothouse, a sliding hatch leads to the split-level flybridge/boat deck, another area significantly redesigned at Lord’s request. The blond teak decking with grey caulking extends to the boat deck, normally topped with a non-skid finish over glass. It is spacious enough for Lyons Pride’s 6.4 metre centre console tender and a jet ski and, with the toys offloaded, it’s a great sunbathing area with a spa pool. The new raised banquette seating on both sides is springy and very comfortable and allows anyone to get a good look over the sides and through the windshield. That was a request Lord made especially for Anne Marie, who is petite, but it makes sense for anyone. And again, because many owners operate the 112 themselves or with limited crew, two of the four remote control stations – in addition to the central helm station – are on this deck. Back inside, the fit, finish, materials and brands are of the highest calibre. 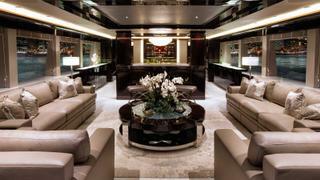 Working with Westport’s in-house design team, the Lords created a sophisticated yet personal décor. A bronze pelican, picked up in Key West, Florida, and a humorous “running man star fish” – dried with legs bent as if in motion – are a few of the items that make Lyons Pride their very own and not a mere showcase. The décor’s underlying inspiration is the nautical world. A Montreal light feature from Wired Custom Lighting twinkles above the dining table. “It reminds me of the sea urchin and that is what caught my eye,” says Lord, who chose it. “It normally hangs as a chandelier but they modified it so it would not swing.” Framing it is recessed LED lighting that sets aglow a lining of pearlescent capiz shells. 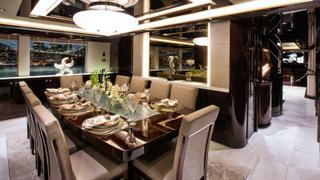 The shells also decorate the sideboards on either side of the large dining table, custom built by the yard’s craftsmen. The Lords chose various seashells for the glass top of the dining table and a companion coffee table in the adjacent saloon, where the colour scheme of light greys and dark wood continues. A coral motif embroidered on the Kravet cushions strewn on the Townsend upholstered sofas recalls the nautical theme in a playful way. “We are not formal people by any stretch of the imagination,” Lord says, adding that the family will share a meal with the crew in the dining saloon, which gets used even for an informal spaghetti night. The layout works well for a family. The forward VIP has its own access forward of the galley and a separate staircase leads to the master cabin, which is generous enough in size to comfortably hold a California king flanked by a sofa and a dresser, and there are two guest cabins with extra Pullman beds for the kids. 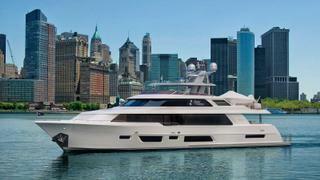 The new Lyons Pride is not a one-off: many of its features will be implemented on the new generation Westport 112 line, making these owners the proud instigators of an American yacht design evolution.